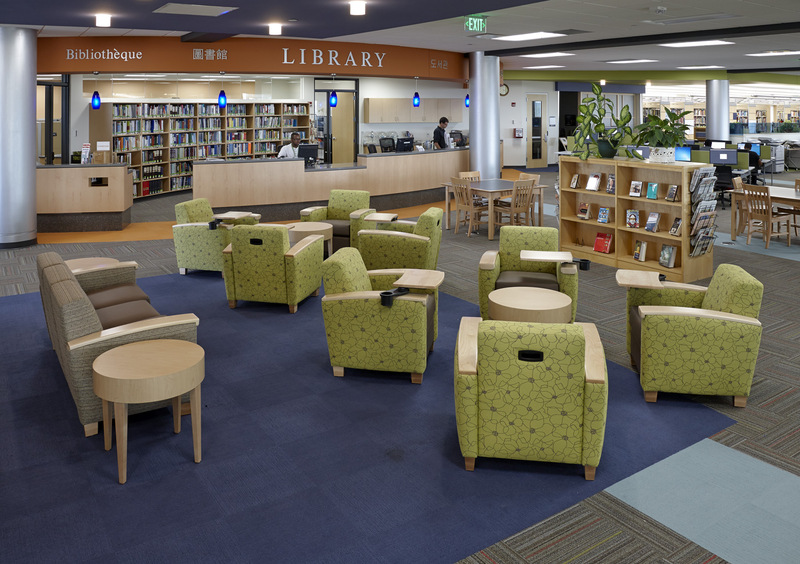 Libraries are continually looking to improve and provide great spaces for patrons and staff. 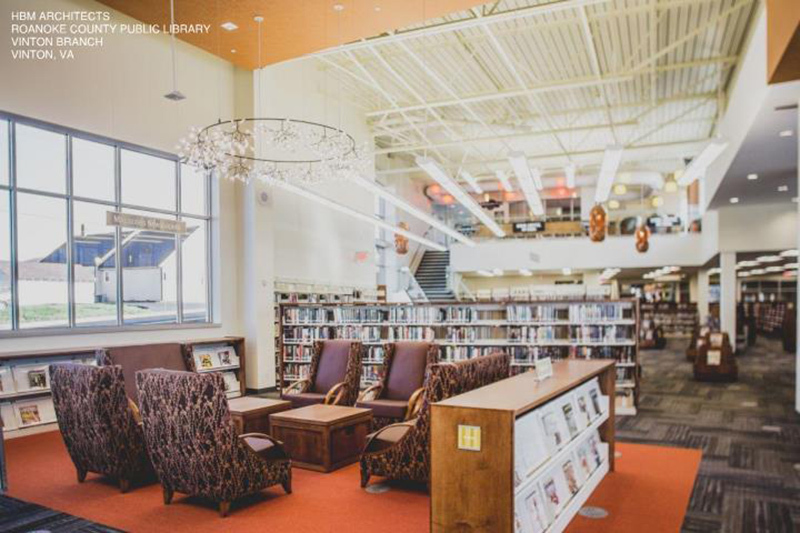 Technology is constantly changing, and there are so many facets to library design that library interiors are constantly evolving. 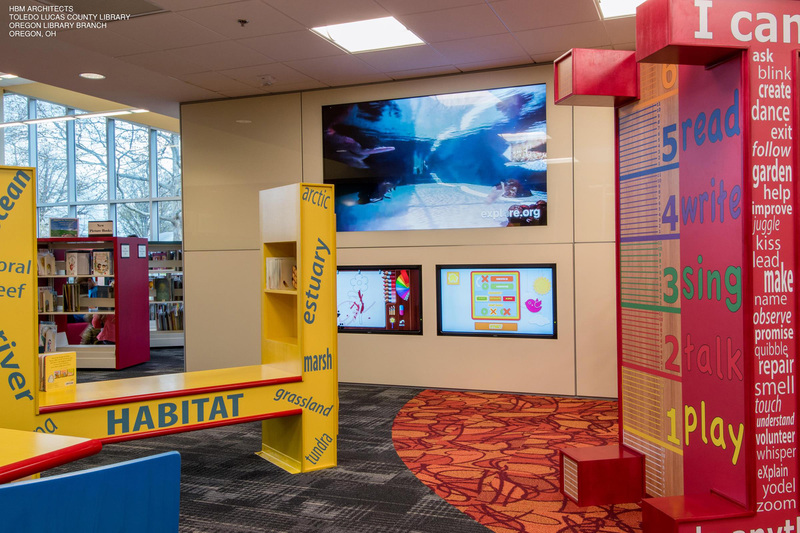 Some of the most common trends in library design we’ve seen recently are both technology driven and architecturally driven. 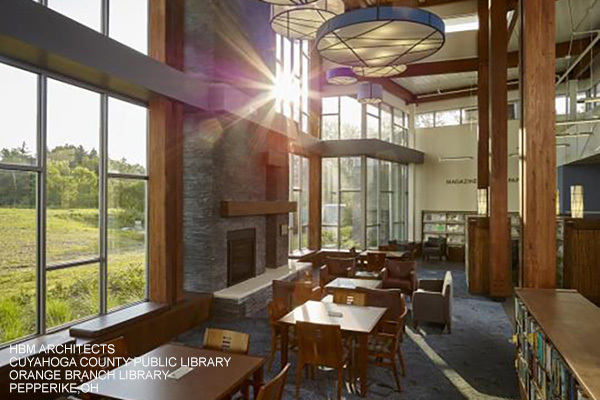 These types of spaces are being emphasized in building design for both new and existing libraries. 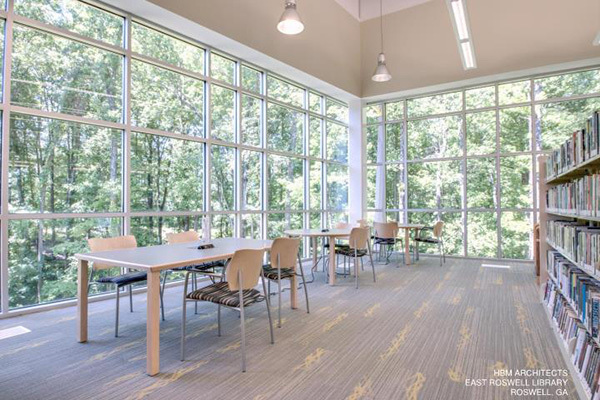 Sustainable practices and the general trend for healthier lifestyles have driven the demand for more natural light and views to the outside. Add or build larger window areas for more daylight. 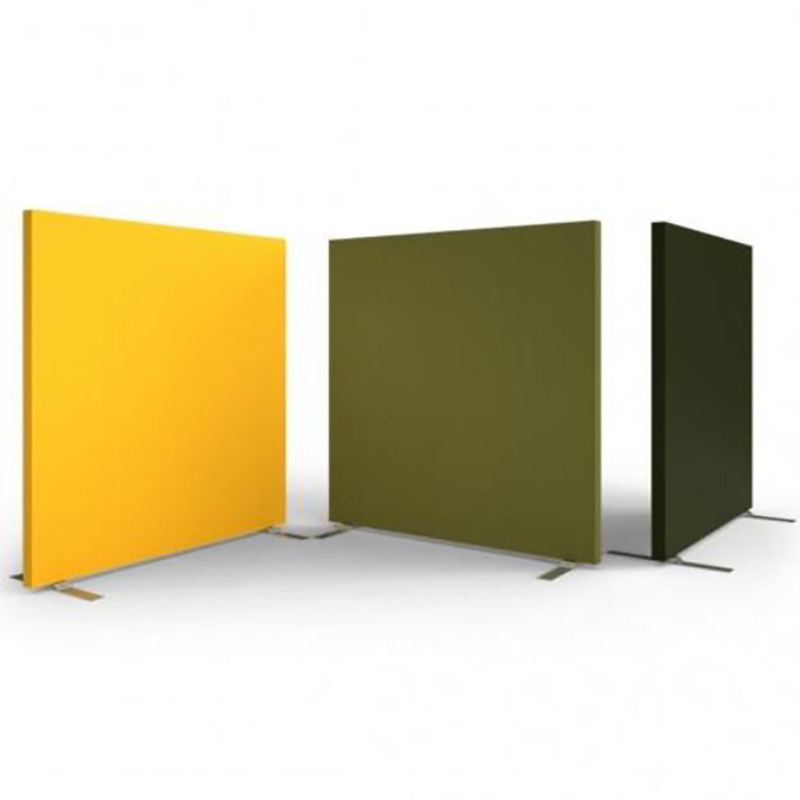 You may need to consider sunshade devices, depending on the façade exposure. Build fewer permanent or full-height interior walls. 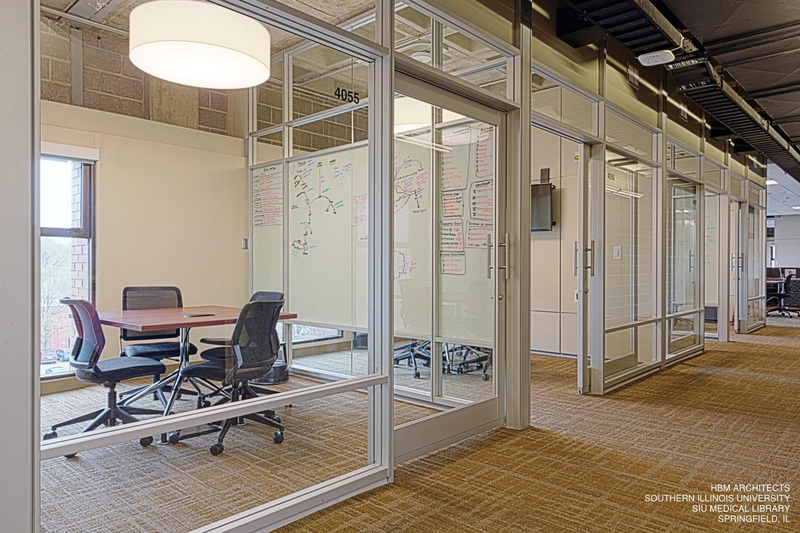 Add interior windows to bring light farther into the building while allowing sound separation. 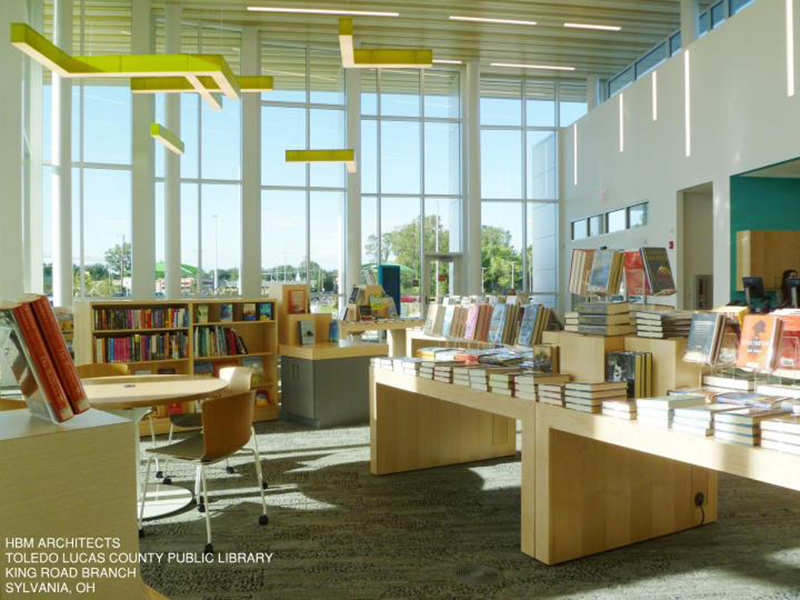 Lower the library shelving to extend natural daylight farther into the building. Instead of using the walls, use color or floor pattern changes to designate or highlight areas. 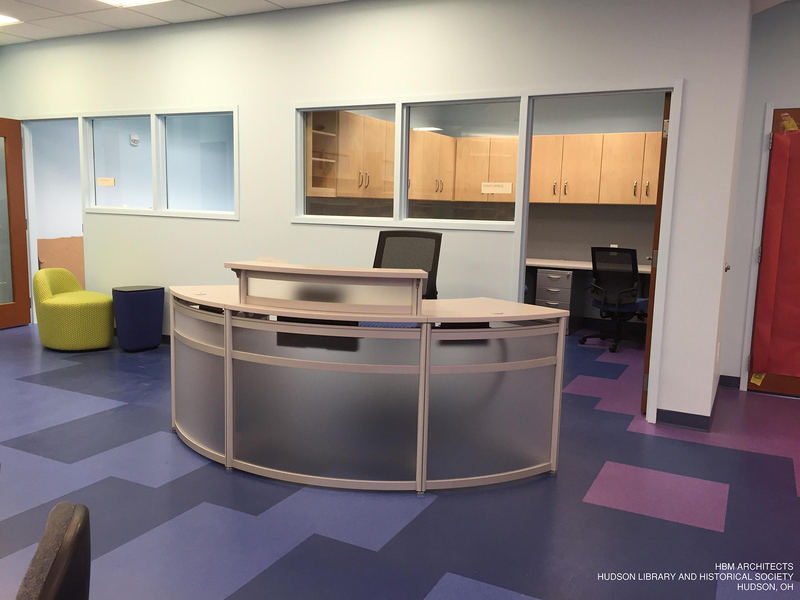 Designing spaces with flexibility in mind supports many aspects of successful library design and evolving needs. 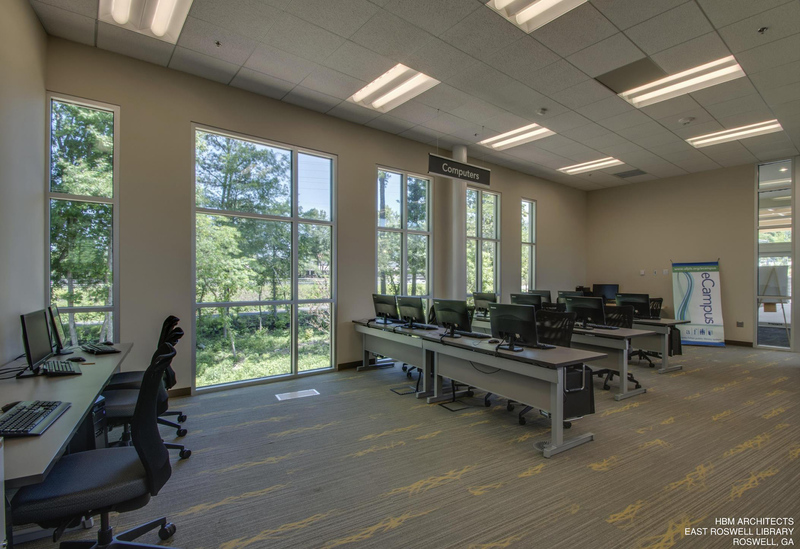 Provide fewer built-in service counters and computer stations or study carrels. 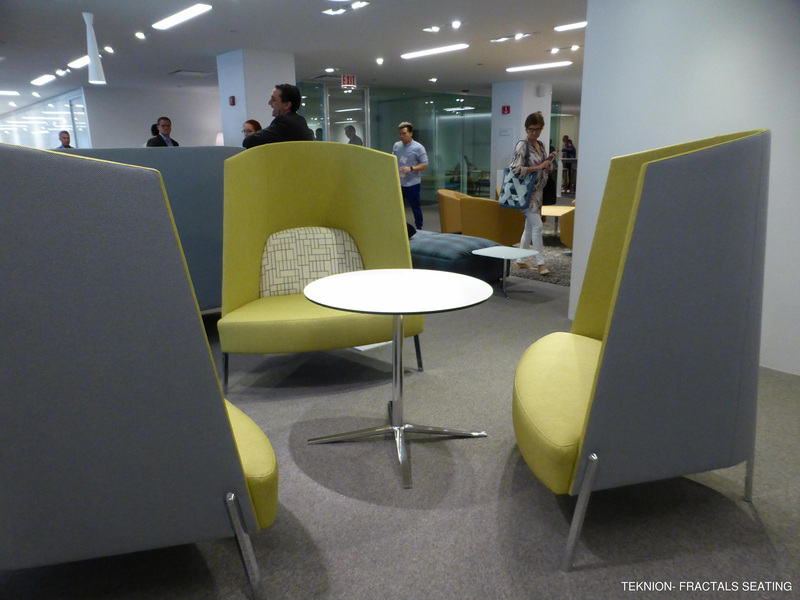 Opt for modular furniture pieces to accommodate these functions and allow for future reconfiguration with minimal disruption and cost. Use mobile service points. 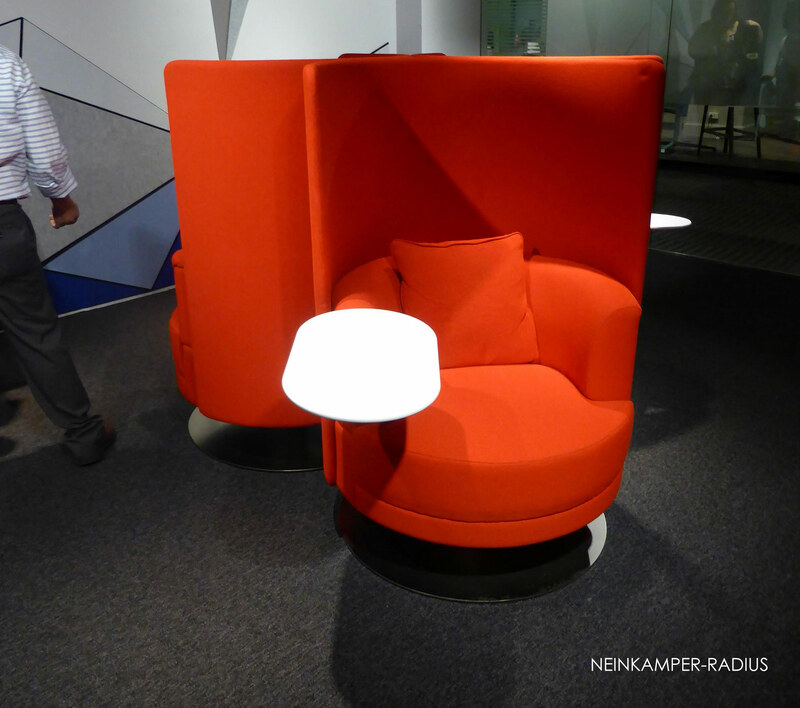 These allow staff to occupy areas of the library during times of peak use, but they can be easily folded and moved away at other times. 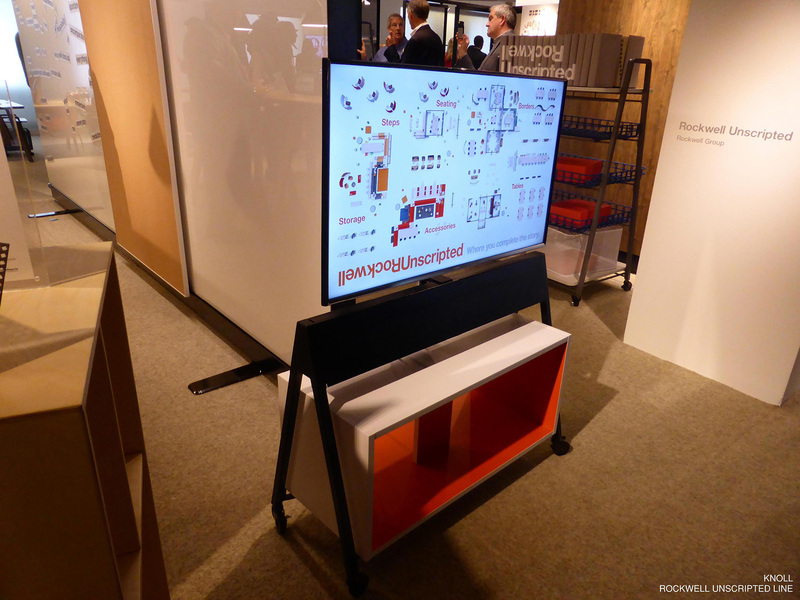 Use furniture and shelving to designate spaces without walls. 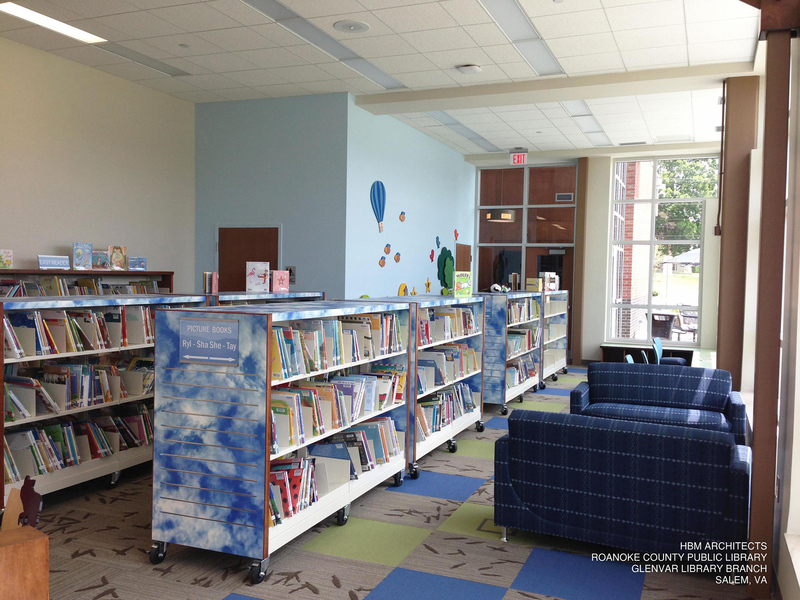 Lower shelving will make it easier for patron wayfinding as well as staff oversight. 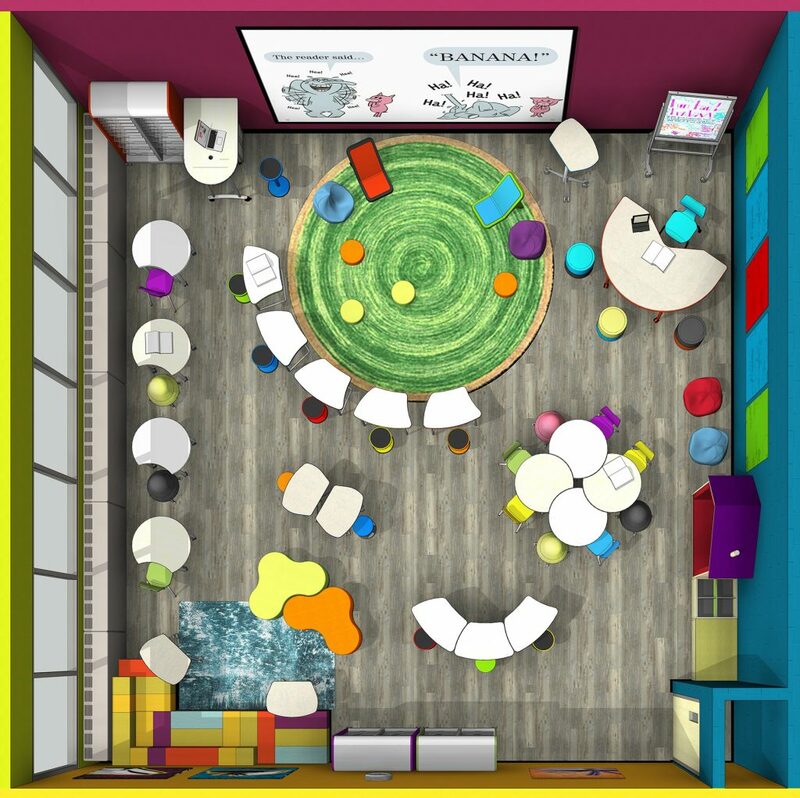 Use mobile furniture and library shelving as a great solution for multi-purpose space needs, like teen and children’s areas, or for small libraries with limited space. 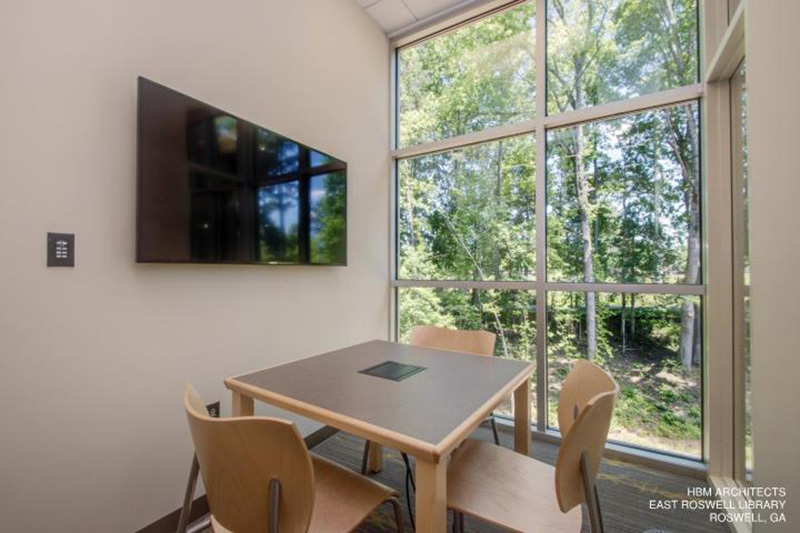 Academic libraries can utilize mobile furniture for quick and easy reconfiguration in areas used for impromptu lectures or instruction. 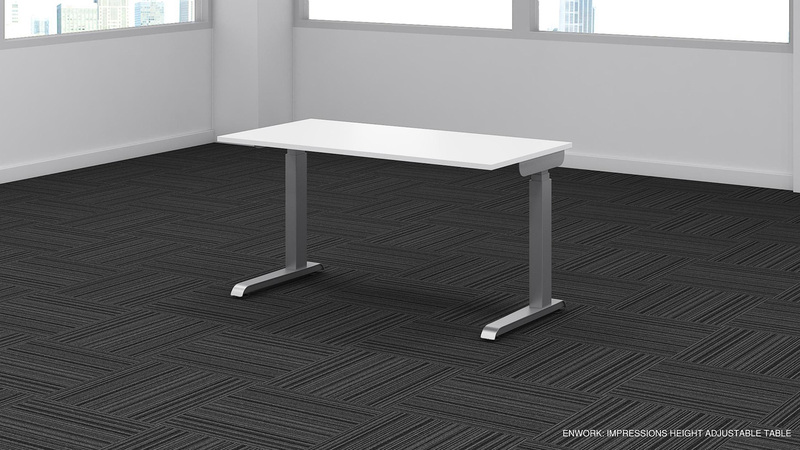 Raised access floor systems for new construction incorporate power, data and mechanical systems under the floor panels. One of the many benefits from a system like this is that it allows these components to be relocated without major construction. 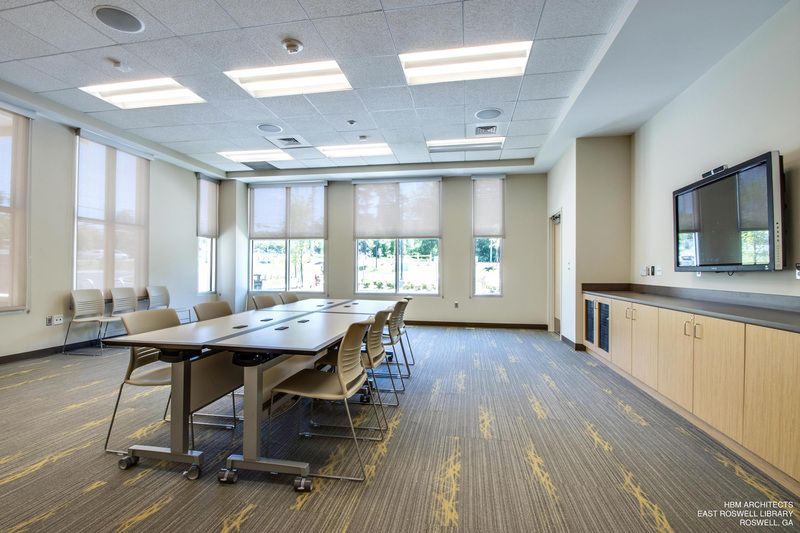 An additional benefit is that heating and cooling vents up from the floor and efficiently conditions the volume of space where patrons occupy and not the upper volume like traditional ceiling-vented mechanical systems. This creates a more evenly conditioned building. Low-profile access floor systems can be a great solution for renovation projects. These systems accommodate power and data to be placed anywhere, with the ability for receptacle relocation. 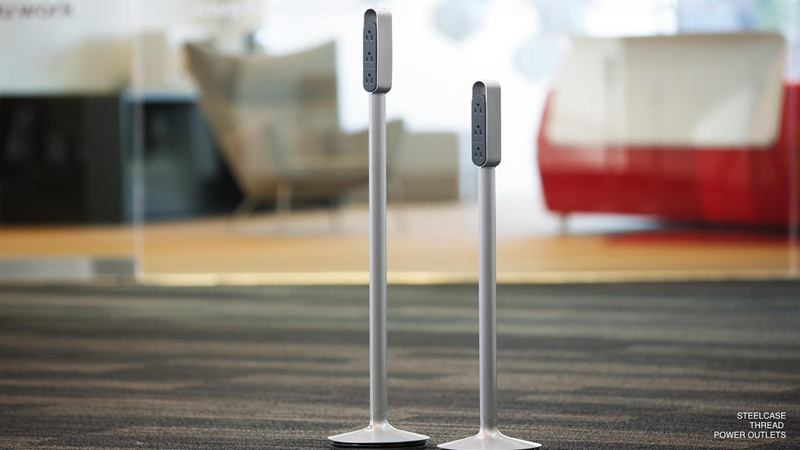 These floor systems generally are 1.67 inches to 3 inches high and require some shallow ramping from areas that cannot be raised, like restrooms and exit stairs. 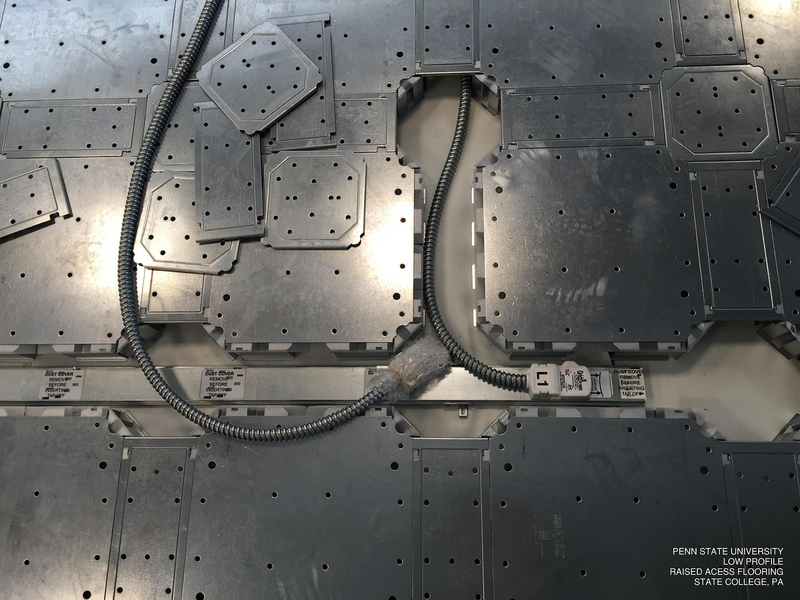 Power devices that can be relocated without major work offer an economic solution for tight budget projects and light renovations; however, they are not as seamless as the access floors. 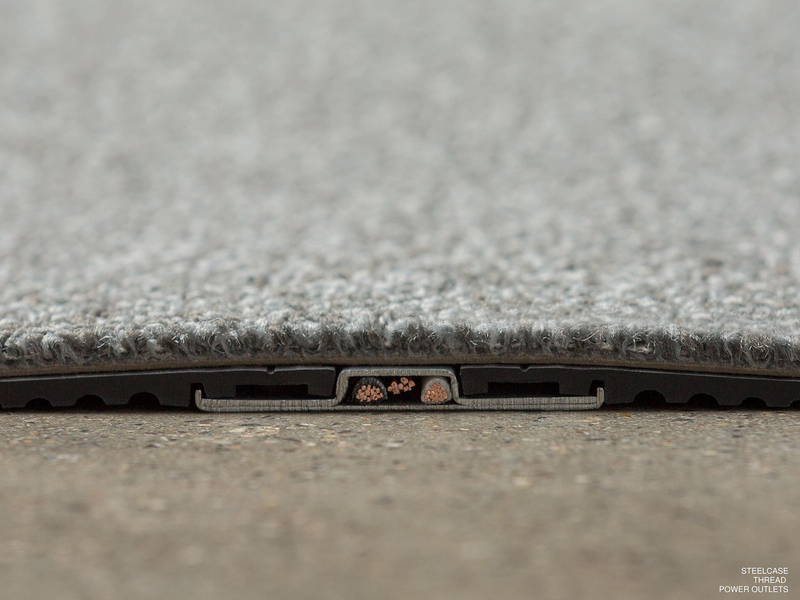 Under-carpet wiring is more economical than low-profile access flooring, but receptacles will sit on top of the floor. 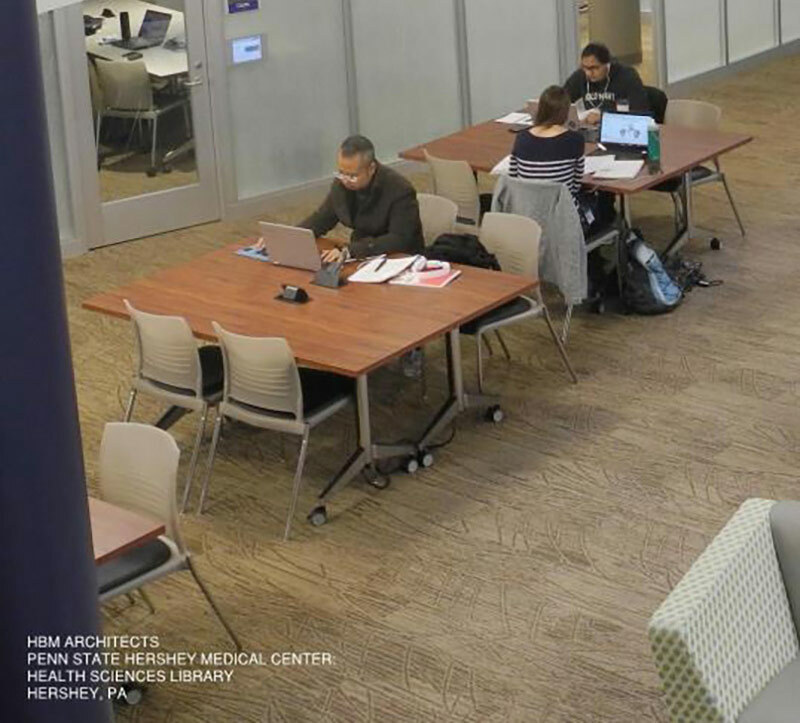 Sit-to-stand tables and study carrels are crossing over from office use to libraries. 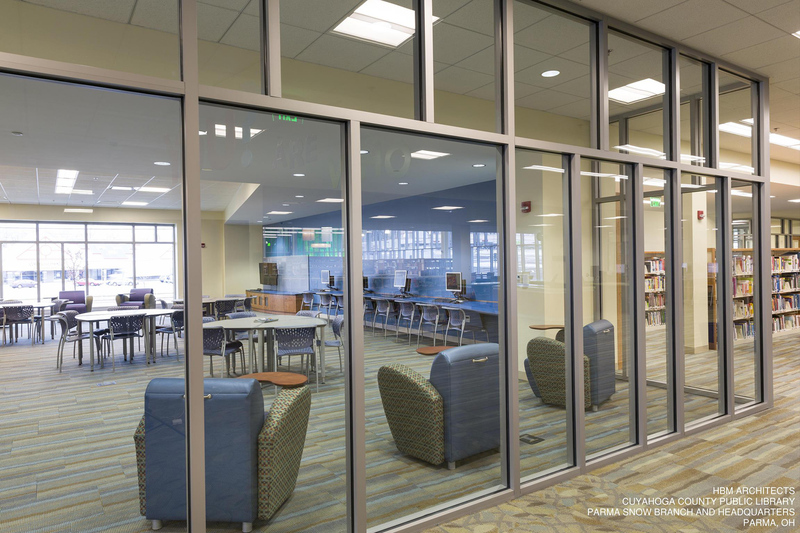 Patrons, students and staff working or studying for long periods of time prefer the option to stand for part of that time. 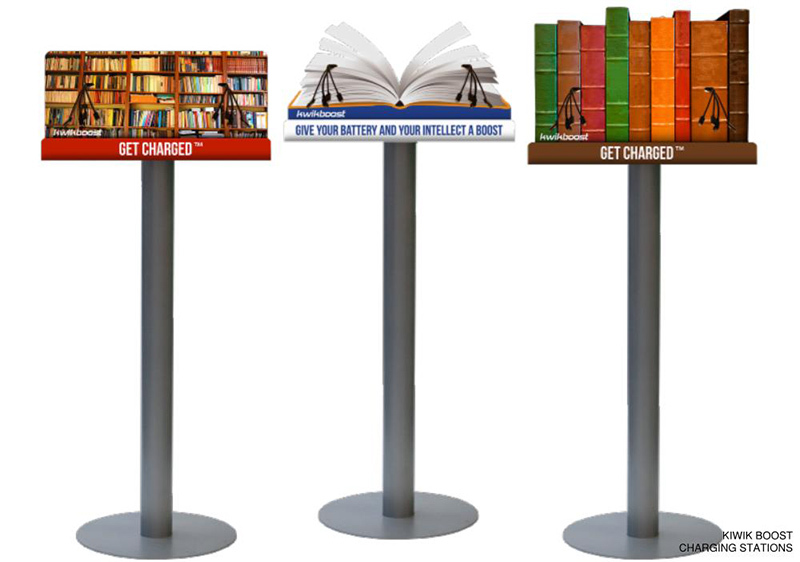 Multiple types of furniture for various areas of the library are being specified with castors for easy reconfiguration. 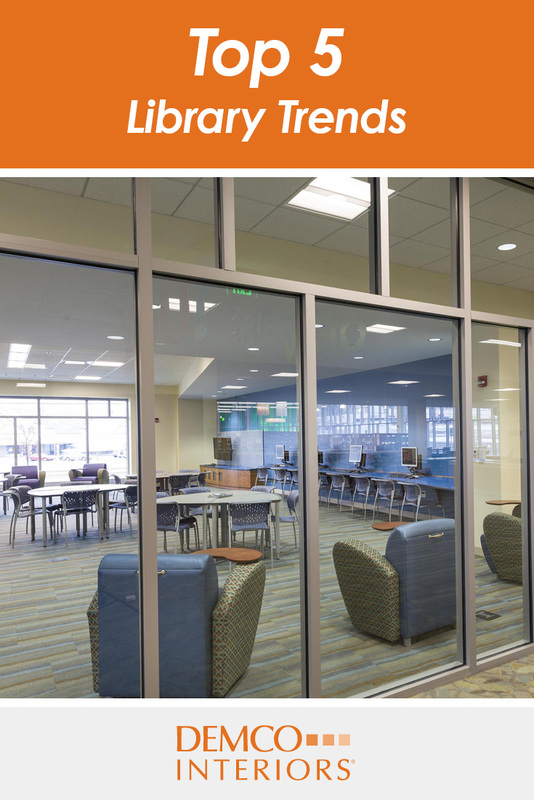 Study tables, metal shelving and lounge chairs are the most common. 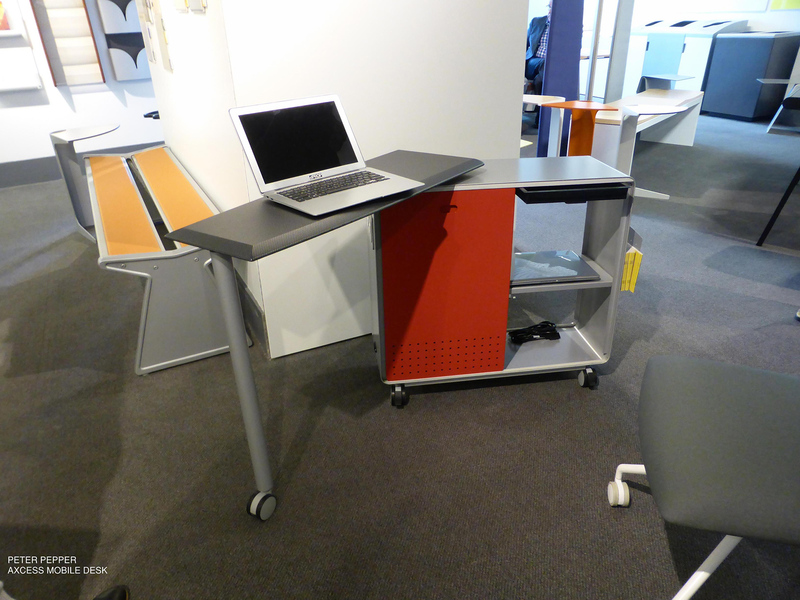 Flip-top mobile tables are replacing folding-leg tables in meeting rooms, so one person can easily set up the entire room. 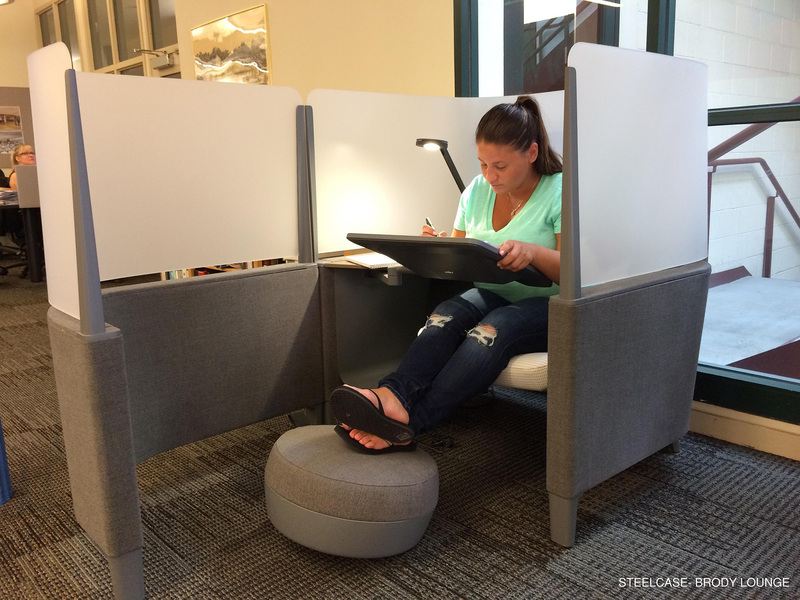 Study pods, or lounge carrels, are growing in popularity in academic libraries because they create semi-private, focused work areas inside a larger space. 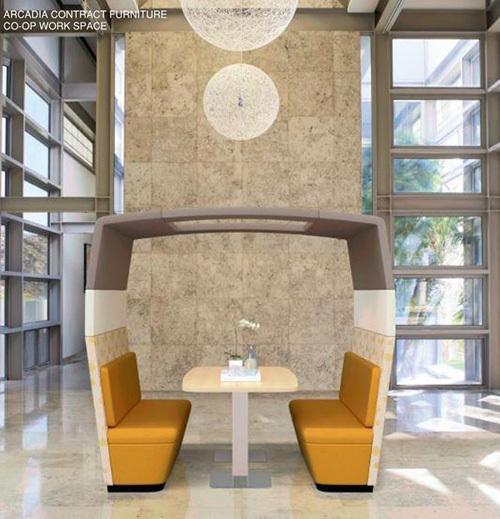 High-backed lounge seating can create a singular focused space or be grouped together to create a small-group space within a larger open area. 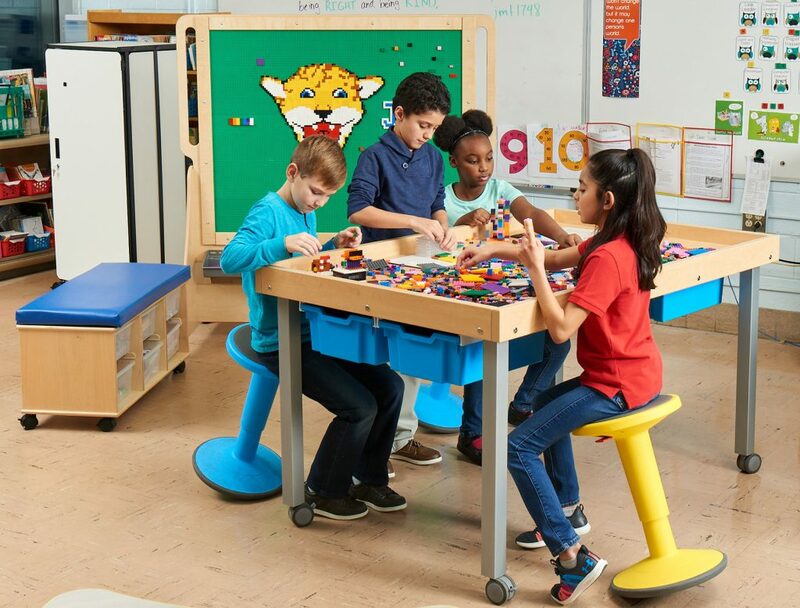 Collaboration stations that can share content through a WiFi or Bluetooth connection are becoming more common since most personal devices support wireless connections. 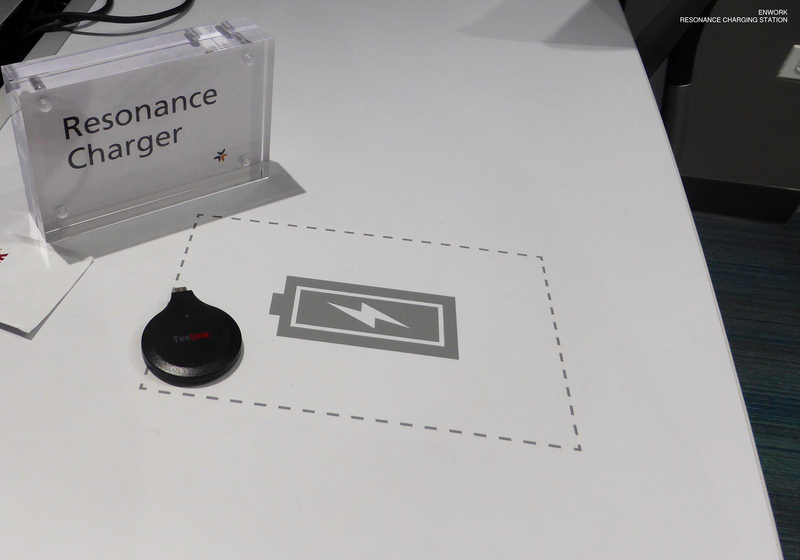 This allows nearly any powered table to work for collaboration with a monitor. 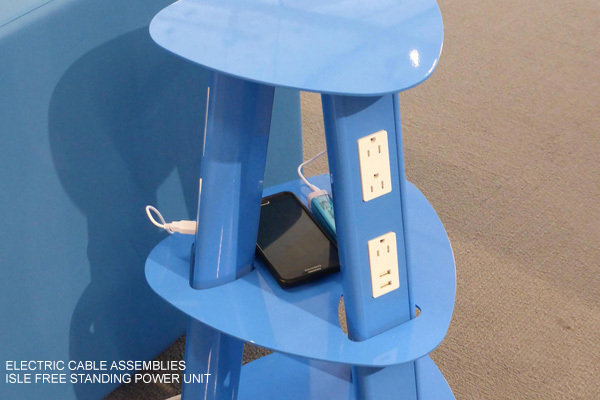 If you have furniture in good condition, an economical approach would be to refurbish existing tables with new power and provide a mobile monitor with storage for the wireless components. 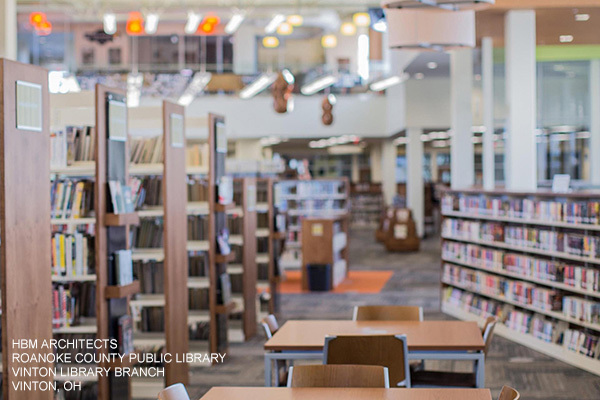 These are just a few of the trends we’re seeing in libraries. 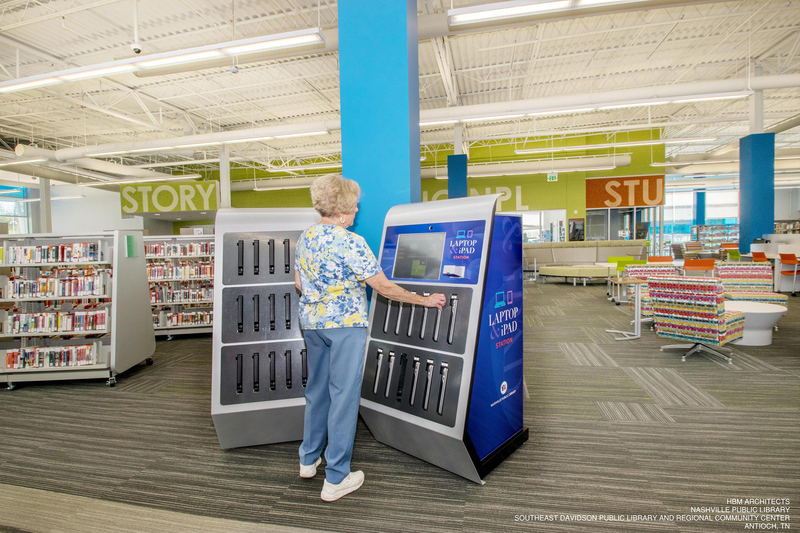 It is fantastic that the role of libraries continues to grow in their communities and evolve to better serve their users.